Pike Place is the one street in the entire City of Seattle where the pedestrians do not cower in fear of the automobile. Locals and tourists alike step off the curb and meander down the middle of the street among the crawling cars. It’s near chaos but it works. I disagree with those who say Pike Place would be better closed to cars. The space would feel too empty without them, and would lose much of its irresistible messy vitality. But more than that, the rare dynamic between cars and pedestrians that happens in Pike Place is a much needed crack in the edifice of car tyranny that gives people a taste of an alternative. And in cities across the U.S, appetite is growing for such alternatives. New York City is on the forefront, and incremental, small-scale modifications are already adding up to a palpable change in the urban environment. Last summer Seattle experimented with car-free days in Capitol Hill and Alki. 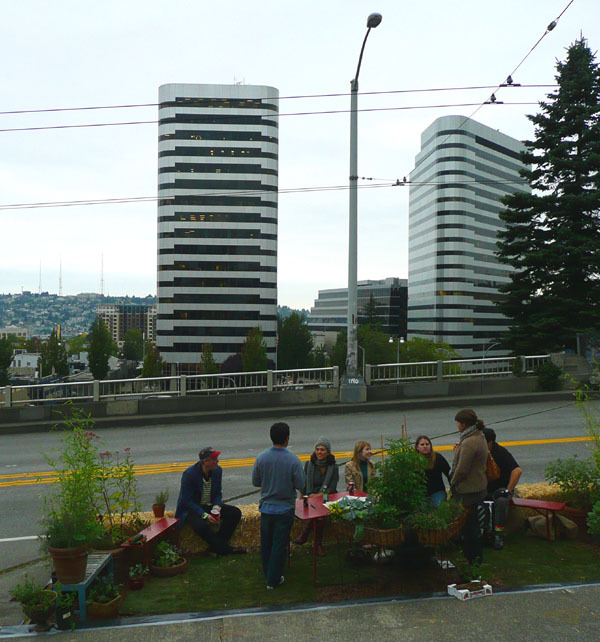 In September Seattleites participated in National No Park(ing) Day, commandeering on-street parking spaces, as in the photo below. The Seattle Great Cities Initiative has been taking an increasingly active role in this movement with their “Streets for People” campaign. The group is putting on a Kickoff Forum event on Thursday, February 12, 5-7 p.m, at the Armory at Lake Union Park. If you think that Seattle should have more than one street for people, go check it out. Posted by dan bertolet on	Sunday, February 1st, 2009 at 6:25 pm. You can follow any responses to this entry through the RSS 2.0 feed. You can leave a response, or trackback from your own site. You’ve nailed it. Pike Place is a street in the truest sense of the word. If only there were more in Seattle like it. I totally agree. I moved here from Phoenix almost a year ago and for the longest time I walked on the sidewalks at the market. Walking in the street in Phoenix is just asking for trouble. Now, I like to wander about the cars knowing I’m moving twice as fast as they are. having lived most of my life in europe, and being extremely fond of the fussgaenger zone (pedestrian zone), i would be enthralled if downtown were closed to traffic except for public transportation and deliveries. but alas, that won’t ever happen here. Yes! Right in so many ways… I remember watching a series of urban film shorts in Oakland CA 5-6 years ago and was stunned to see three film clips of the same trip down Market St in succession. The first was circa 1905, prior to the quake, and showed a wonderfully chaotic mix of people on foot, on horseback, in horse-drawn wagons, on streetcar and in Model Ts. Everyone shared the space of the street. The next clip was post-quake, but the last was circa 1990 and showed a much larger city, at least based on the size of buildings, but none of the vitality of the first clip. Not that I long for some car-free era long passed, or for horses to regain prominence, but it would be so nice to feel like the space devoted to streets was truly a public right-of-way; there for the equal use of all. Too often I feel threatened by vehicles encroaching on crosswalks, too impatient to allow me passage, outwardly annoyed at my inferior means of travel. Pike Place displaces the primacy of the automobile, bringing a bit of equality to the street for at least a couple of blocks and expanding access to the public realm. Obviously not a model for all streets, but more would be nice, even if for only a day a week. Something like Memorial Drive in Cambridge MA on Sundays would be a start. An absolutely awesome place to be. I would like to say I would rather see it without cars. In the summer, the market is at it’s best when new vendors spill out to the street and people are shoulder to shoulder walking where cars normally park. Or, imagine it like the yearly summer taste of the market with tables and chairs on those cobble stones. Or better still, why not like the piazzas of Italy. Where the mood and use changes through out the day: Baked goods and produce in the morning through the mid-day clearing up to school kids in the afternoon and closing with a candle light dinner or an evening drink after a home cooked meal. Maybe our dear Pike Place is in need of another layer and a nudge into it’s second phase along with a pat on the back? Wow, I have to say I totally disagree about Pike Place. You seem to assume that no other use of the street could be made, but of course another row of stalls — permanent or temporary structures — could be added along Pike Place. As Spencer notes, there often are stands out there during the summer, but the congestion added by slow-moving cars makes it kind of a pain to get to them. At the same time, the Market is so crowded that it can be hard to move through, let alone devote attention to all the shops, especially in the summer. I would also point out that there is no earthly reason why people should drive down Pike Place. There’s a miniscule amount of parking, so cars drive down looking for space and just get in the way. Meanwhile, Virginia St. is a much quicker connection to Pacific and the parking garages. 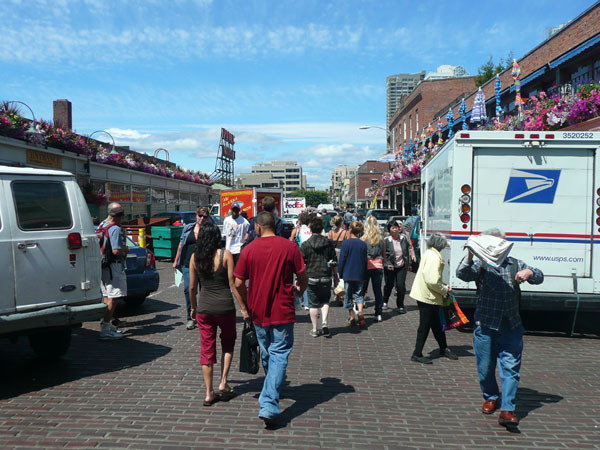 The *only* traffic that should be allowed on Pike Place is delivery vehicles. I kind of see your point about the power of pedestrians mixing with vehicles without being afraid, except that I think the psychological impact of having a street in Seattle that is permanently reserved for pedestrians would be much more powerful. As it is, cars intrude on what really should be the domain of foot traffic. It’s kind of long, but it’s good. Recently moved to Seattle from Vancouver, BC and am enjoying your conversation here. The revised Mercer design also eliminates traffic signal priority for the South Lake Union streetcars. Instead of getting an automatic green light at intersections, the streetcars will stop with the rest of traffic, which is expected to add several minutes to streetcar schedules. During the summer months, having a constant stream of confused tourists who think they will find a place to park right in front of the market is a real nuisance on Pike Pl. I don’t have a serious problem with delivery trucks using the street, but I’d still like to see it closed to other traffic, possibly with parking removed, adding more room for outdoor shop booths. I don’t even think we need enforcement or gates to do it. A simple sign saying “commercial traffic only” at each entrance and a few loading only signs at the parking spots would remove most traffic. But besides the finer point of cars being allowed, I think we need many more people streets. My favorite cities in the world have significantly large areas of people streets.